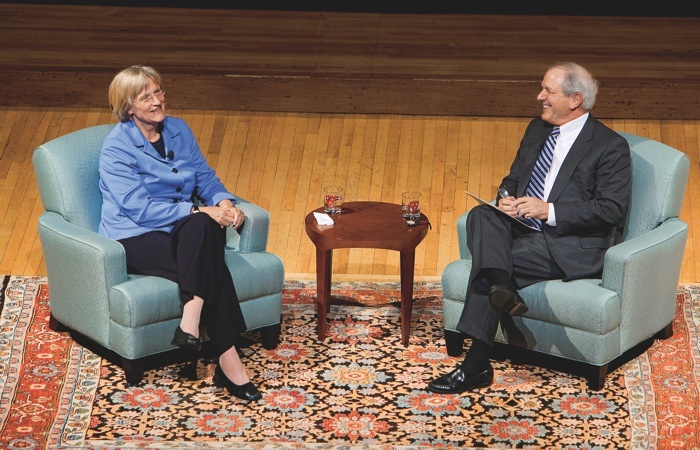 During a conversation at her Massachusetts Hall office on September 8, and in a September 21 Sanders Theatre dialogue with former ABC news anchor Charlie Gibson, President Drew Faust sounded sanguine notes about the condition of the University and its direction. After the “unanticipated, earthshaking crises of 2008-2009” (when the endowment’s value sank by nearly $11 billion and Harvard faced liquidity challenges), she said, it feels as though the institution has “come through a thunderstorm and into the sunlight again.” She touched on finances and operations (fortified by positive investment returns for fiscal year 2010--see “Endowment Improvements,” page 58); Harvard’s ability to sustain its core academic priorities; the prospects for a fundraising campaign; the findings of scientific misconduct by a faculty member (see “Scientific Misconduct, and Its Aftermath,” page 57); University governance; and other matters. Highlights from the two conversations follow. Operations, and academic initiatives. Faust said that fiscal constraints had “given us the opportunity” to scrutinize how work is done, from the individual schools to the central administration. Necessity provided the impetus to examine practices that had developed unplanned, and to reconfigure them where appropriate. The result, she said, is a set of better procedures, such as those arising from the study of Harvard’s dozens of libraries (see “Libraries on the Edge,” January-February, page 41): better integrated operations, tangible efficiencies, improved collecting practices, and enhanced digital capabilities. “We wouldn’t have undertaken that scrutiny” and brought people together to address problems and pursue new opportunities without a sense of crisis, she suggested--and was reminded, she joked, that as a Civil War historian, she had written a book titled Mothers of Invention. Gibson, now a Shorenstein Fellow at the Harvard Kennedy School, asked about the administration’s citing of financial straits for everything from the termination of hot breakfasts in undergraduate Houses to the halting of construction of the science complex in Allston. Addressing meals first, Faust explained that Harvard had focused on essentials: teaching, scholarship, and financial aid; confining undergraduate hot-breakfast service to one location, rather than 12, made sense as the University trimmed dispensable spending. About campus development, she said Allston “is critical to the future of Harvard--but visions for academic use would be realized “much more slowly” because of the financial crash. She insisted that the University now has no timetable for development, and is, as reported, trying to lease properties it has bought; provide community amenities; and explore options including commercial co-development--part of a broader “re-envisioning” that might yield a lively mixed-use community of academic, institutional, and private investors during the next 50 years. When Gibson asked whether Harvard’s commitment to financial aid was sustainable, Faust responded firmly that it was, because the most important of Harvard’s commitments is to attract talented individuals regardless of their financial circumstances. Scientific misconduct. Concerning the findings that professor of psychology Marc Hauser was responsible for “eight instances of scientific misconduct” under the Faculty of Arts and Sciences’ (FAS) standards, Faust--who had not addressed the issue publicly before--said on September 8, “This is something at the core of who and what we are. We must support scientific integrity. We must assure scientific integrity.” Then, and when pressed by Gibson--who asked why Hauser was still a member of the faculty, and suggested that University-level silence on the issue had been “somewhat deafening”--Faust explained that the review of the initial allegations of misconduct (reportedly begun in 2007) was necessarily lengthy and appropriately conducted within FAS: the complex matters involved require faculty experts who understand how research is conducted to determine when it has been done inappropriately. Peer institutions proceed similarly in comparable cases, she noted. Furthermore, she is “committed to appropriate levels of confidentiality” so that such investigations can protect complainants, individuals whose work is being reviewed, and subsequent federal investigations (where required, as in this case, because federal research funds supported the work); but, she added, Harvard had disclosed more in this instance than in the past. Within that context, she continued, the findings had prompted extensive conversations about how to right the scientific record, how to make sure investigative procedures operate in the best way, and how the discoveries should be communicated--and at least some of those matters will be reviewed at the University level. Openness--and its opposite. What vision would Faust propound for the central aim of her presidency? Gibson asked. “I would like people to feel that Harvard is open to them,” she said: to enroll, and, within the institution, to cross any internal boundaries that might stand in the way of their research, teaching, or learning. In that context, Gibson subsequently inquired about the controversy surrounding Martin Peretz, Ph.D. ’66, a long-time social studies lecturer whose teaching and mentoring experience were to be recognized September 25 during a fiftieth-anniversary celebration of that undergraduate concentration--but who had also prompted sharp criticisms for his broad attacks on Muslims* (see “50 Years of Social Studies,” page 62). Ought Harvard to be honoring this man--in a research fund raised in his name? Gibson inquired. *Blogging in early September, Peretz had written, as editor in chief of the New Republic, “Muslim life is cheap, most notably to Muslims,” and added, “I wonder whether I need honor these people and pretend that they are worthy of the privileges of the First Amendment which I have in my gut the sense that they will abuse.” These comments prompted New York Times columnist Nicholas D. Kristof ’82 (recently elected an Overseer), to lament the “venomous and debased discourse about Islam” represented by Peretz’s post. James Fallows ’70, writing for TheAtlantic.com, denounced Peretz for “an incredible instance of public bigotry in the American intelligentsia.” On September 13, Peretz posted “An Apology,” saying he was embarrassed about the sentence concerning Muslims’ First Amendment rights, but stating about his other sentence, “This is a statement of fact, not value.” For Yom Kippur, Peretz followed up with “Atonement,” noting that “in this past year I have publicly committed the sin of wild and wounding language, especially hurtful to our Muslim brothers and sisters….I allowed emotion to run way ahead of reason, and feelings to trample arguments. For Faust, who had just talked about making Harvard open and inclusive, these are obviously fundamental matters. She referred to her remarks on this theme at Morning Prayers, at the beginning of the fall term. (Then, she had said, after recounting the University’s increasing openness to blacks, women, and gays and lesbians, “Much of Harvard’s history, especially in the past half-century, has been a story of extending the opportunities for belonging, challenging not just our own institutional assumptions but working to become an agent of change and openness in society more broadly.”) Peretz’s comments, she said, “struck a very different chord”--the suggestion that there are people who aren’t valued. Those sentiments, she said, were clearly at odds with the values Harvard wished to embrace. Peretz himself, she said, had recognized the “wild and wounding” nature of his remarks. Asked whether there would be a public component to the Corporation’s process, Faust responded that the Corporation and the wider group are reaching out, talking with many people--as she was--and sharing more fully their queries and what they had learned. But the work inherently could not be fully turned into a broad process for decision-making, she noted: undergraduates are not necessarily the best advisers on how the Corporation should carry out its fiduciary duties. What course the process ultimately takes and the conclusions it reaches depend, she said, on what Corporation members and those with whom they consult think is needed--“what the absences or omissions have been and trying to fold those in” to a more effective way of proceeding.